"I'm not superstitious... until I go to send out a proposal. Then I have to sign the cover letter - not with just any pen - but with a pen from a fellow multi-published author. Or I can use my "Never Give Up" pen, given to me by one of my beloved critique partners. That pen's okay too. Next, I have to address my label with a nearly brand new pointy, black Sharpie - nothing else will do. And before I leave the house to go to the post office, I always say a prayer or two... Or ten... sometimes fifteen... or... well, even more... I'm not saying this always works... but why take a chance?" 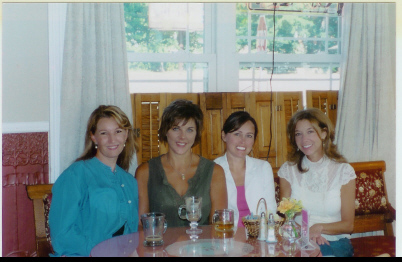 Cathy Liggett (right) with critique partners at the real Corner Coffee Cafe which served as inspiration for the setting of Coffee, Tea or Molly? Below is a Complete Bibliography per Cathy's website as of March 2007. #2 - Coffee, Tea or Molly?